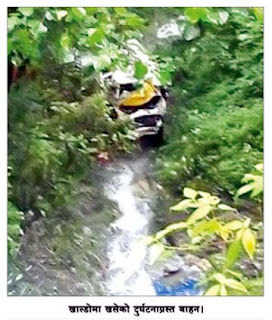 Four persons were killed and three injured in Chanjey today when an SUV they were travelling in rolled 250ft into a gorge because of alleged negligence of the driver. The inspector of Temi police station, Bimal Gurung, said seven passengers had hired the car on share basis to reach Gangtok from Khecelpari and the accident happened due to the negligence of the driver. "Villagers informed police about the incident. Damber Kumari Sharma, 43, and driver Tarcho Lepcha, 30, died on the spot. The rest were admitted to the district hospital in Singtam," he said. "Sonam Dadul Lepcha,30, and Parishari Ahmed, 38, succumbed to head injuries at the district hospital. Later, other three injured were admitted to STNM hospital," he added. The local villagers and the police recovered the bodies. Four persons were killed and three injured in Chanjey today when an SUV they were travelling in rolled 250ft into a gorge because of alleged negligence of the driver. - According to an injured passenger, the driver was listening to music using a headphone connected to his mobile. The accident happened as Tarcho lost control while changing song and the car fell into the gorge. The headphone was found plugged in his ears.